I want to inform everyone my newest up-dated edition of my book “The Last Chronicles of Planet Earth” is ready for you to download, or just read it at my post as you will. 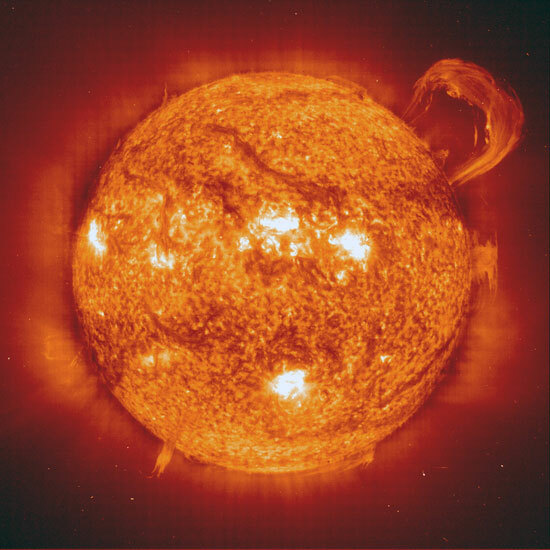 Our Lord warned us that in the last days our planet would be hit by intense heat from the sun. 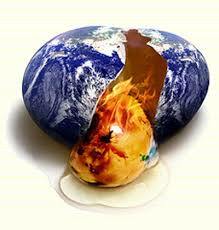 I am not going to engage in the debate if humans are causing global warning because to me it is a mute point. I know what Jesus has warned, us and I know that the intense heat is part of the last days birth pains. There have been many articles written saying we are heading into another ice age, yet this is the exact opposite of what we read in Christ’s warnings above. Since Jesus is never wrong, I can and have promised you that you will see new heat records broken in the near future. 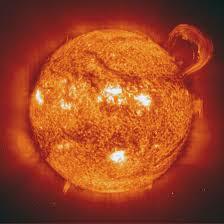 I think if you ask the people living in India if the sun is scorching they will agree with above scriptures. Here are the latest facts in a report entitled: “Hundreds die in Indian heatwave”. The subtitle read as follows: “Death toll expected to rise as India faces record temperatures of up to 122F in hottest summer on record” “Record temperatures in northern India have claimed hundreds of lives in what is believed to be the hottest summer in the country since records began in the late 1800s. If you do as Jesus asked you, and keep on the watch, you will witness everything Jesus told you come to pass. There is one very important fact you need to know. This heat judgment will reach its max during the seven year tribulation period. If you love Jesus and have received Him as your Lord and Savior you will be in heaven with Christ while this judgment is being poured out on a unbelieving world. Prophecy Sign: One of the last day signs which is a sure sign the unbelievers are about to enter the seven year tribulation is the sign that Israel will be left alone against the world. Zechariah warned the following: “And in that day will I make Jerusalem a burdensome stone for all people: all that burden themselves with it shall be cut in pieces, though all the people of the earth be gathered together against it” (Zech. 12:3). For the past two years the United States has threatened Iran over and over again that if they did not stop building their nuclear program they would take action. What action have they taken? None. None until today when the Obama Administration turned on Israel over its nuclear program. Watch the news with me. In the very near future you will see more moves against Israel coming from the United States. I believe we will witness a huge surge against Israel when the Psalm 83 war breaks out and the world condemns Israel for wiping out their Arab neighbors. Prophecy Sign: Christ warned us we would hear about wars and rumors of war in Matthew 24:7. We also know from the Lord that Israel will face two wars before the tribulation. One of these wars is the Psalm 83 war and the other is the Ezekiel 38 war. 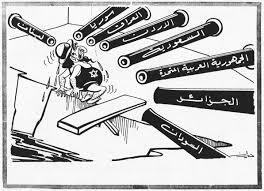 Watching the news surrounding the failed Middle East peace talks we know that the Arabs will be attacking Israel soon in an attempt to take back Jerusalem. I said this before but I am sure I have new people reading this information for the first time. The Psalm 83 war shows us Syria, Hezbollah, and Lebanon will be some of the nations included in this war. Iran is pushing these nations into a conflict with Israel. Anyone who knows prophecy can see where this is heading. Israel will win the war with its Arab neighbors and the nations listed in the Ezekiel 38 war, which will include Iran will then make their attempt in destroying Israel. If you haven’t read Ezekiel 38 you should read it and understand who wins this war and why. I will tell you this, when the war is over the tiny nation of Israel will still be standing! Prophecy Sign: In Luke 21:12 Jesus warns us to look for the sign of Christian persecution in the last days. If you haven’t received Jesus as your savior yet you need to understand that the Antichrist is not only going to try and kill off all the Jews, but he is also going to try to kill off anyone who is a Christian. The tide against Christianity is coming in and we are already starting to see this Christian persecution increase around the world. Here is more news concerning this persecution. “Dear Frank, please feel free to post this to your website if you'd like Thank you so much for the referral to Doug and Tina! They have been a tremendous help at a reasonable price! I appreciate it! Please note this is my new email and I already signed up for your emails with it. Thanks again! What is going to happen if the worse oil spill on record isn’t stopped? The oil spill has already stopped the Gulf fishing industry and has been rising food prices. What has been set in motion is a series of events that is going to put a huge drag on the U.S. which will help her decline. Is it possible God Curse in pouring out on the United States from the ocean floor? In light of all the disasters that have been recorded while the U.S. pushed Israel into giving up much of her land, I would say the curse is getting worse. Can the curse get much worse than it is? What do you think is going to happen when a huge hurricane hits the coast and pushes the oil spill on to the land? You will see major problems as people will be forced to flee their homes as the oil contaminates their homes and water supply. A few days ago 7 people had to be hospitalized as a result of helping clean up the spill. I can assure you right now, that if a hurricane does hit, the government will move in and at that time all hell is going to break out from the citizens living on the Gulf Coast. Many of you may not know this but “The 2010 Hurricane Season in the Atlantic Ocean will begin on June 1, 2010, and end on November 30, 2010. Atlantic hurricanes affect the eastern and Gulf coasts of the U.S. and the Caribbean nations.” Obama better do two things. He better start praying that God will forgive him for trying to divide up Israel, and if he doesn’t do that, he better buy a new rain coat because the storms everyone is worrying about will start slamming the U.S. Coasts. God doesn’t take kindly to anyone messing with Israel! The month of May has been brutal on America. Not only has the oil spill been a huge burden the stock market has taken a hit as will. “May 28 (Bloomberg) -- U.S. stocks slid, capping the worst May for the Dow Jones Industrial Average since 1940, while the euro slumped and Treasuries rose as a downgrade of Spain’s debt rating and escalating tensions on the Korean peninsula triggered a flight from riskier assets. The Dow tumbled 122.36 points, or 1.2 percent, to 10,136.63 at 4 p.m. in New York and lost 7.9 percent this month. The Standard & Poor’s 500 Index sank 1.2 percent to 1,089.41, led by financial shares on the Spanish downgrade and energy companies after U.S. President Barack Obama extended a moratorium on new deep-water drilling. Oil erased gains after rallying as much as 1.6 percent to more than $75 a barrel. Ten-year Treasury yields decreased 7 basis points to 3.3 percent. The euro slipped 0.7 percent to $1.2273. “ Since God has issued a warning about people or nations coming against Israel and Jerusalem, America should feel very lucky the Lord hasn’t collapsed the U.S. already. Prophecy Sign: Nation will rise against nation, and kingdom against kingdom. 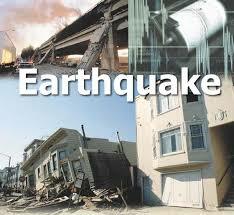 There will be famines and earthquakes in various places” (Matthew 24:7). “For nation will rise against nation, and kingdom against kingdom. There will be earthquakes in various places; there will be famines. These are but the beginning of the birth pains” (Mark 13:8). “There will be great earthquakes, famines and pestilences in various places, and fearful events and great signs from heaven” (Luke 21:11).. “While people are saying, "Peace and safety," destruction will come on them suddenly, as labor pains on a pregnant woman, and they will not escape” (I Thessalonians 5:3). The warnings above are connected in that they warn us of earthquakes, great earthquakes, and the last day birth pains. If you read chapter 5 of my free prophecy book you will see I have been keeping records of earthquakes for some time. 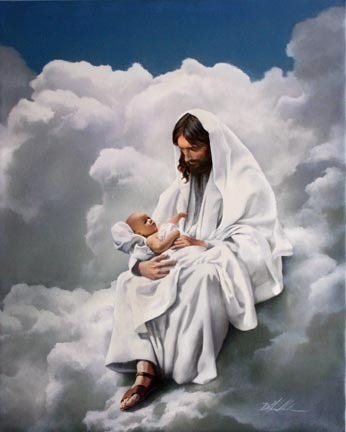 If Jesus warned us that the last days events were going to take place as a woman with birth pains, He is telling us the events of the last days will begin to get much worse as the seven year tribulation approaches. Let’s take a look at the sign of earthquakes today, but first you need to understand, all the last day signs will reach there max during the tribulation. I found another site that uses the information on the USGS to give stats on what has been happening in regards to the number of earthquakes. . If you are new to my site the USGS is a government site that tracks the number of earthquakes around the world. Their link is below. 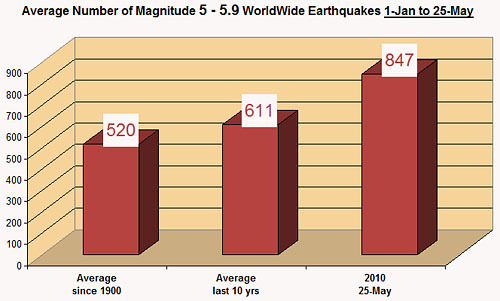 The number of magnitude 5.0 to 6.9 worldwide earthquakes are showing a significant increase so far this year during 2010, and are up 151 percent compared with the same range and time span of earthquakes since the year 1900, as of this independent analysis, 25-May-2010. The number of magnitude 7.0 to 8.9 worldwide earthquakes appear to be on track, or slightly increased from historical averages. Magnitude 4.9 or less was not analyzed partly because they generally cause little or no damage. One could make a logical argument that earthquake detection technologies of the early 1900’s were not what they were decades later, and certainly not as advanced as today, therefore skewing the numbers. That is a valid argument. This would be particularly true when it comes to detecting and recording relatively small earthquakes which require higher sensitivity through more advanced technology. This is partly why I chose not to compare earthquakes below magnitude 5.0. Earthquakes above this level were fairly easy to detect, even a century ago. The data used in this analysis has been collected from the USGS (United States Geological Survey) going back to to the year 1900. I have averaged the number of earthquakes since 1900 in each magnitude range, and have also averaged the same data over the last 10 years. 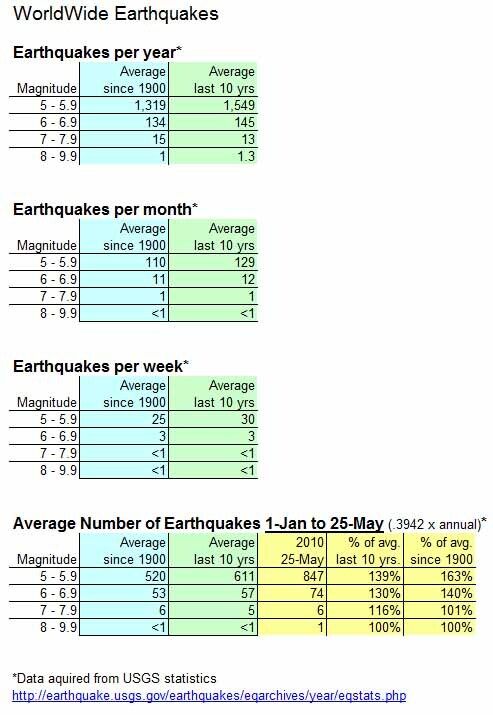 I then compared this data with the current earthquake statistics so far in 2010. Earthquakes of magnitude 5 – 5.9 have increased by 139 percent compared with same range of earthquakes over the last 10 years. 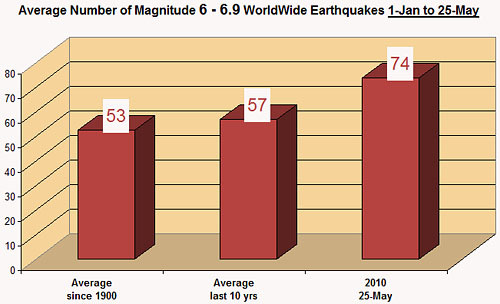 Earthquakes of magnitude 5 – 5.9 have increased by 163 percent compared with same range of earthquakes since the year 1900. Earthquakes of magnitude 6 – 6.9 have increased by 130 percent compared with same range of earthquakes over the last 10 years. Earthquakes of magnitude 6 – 6.9 have increased by 140 percent compared with same range of earthquakes since the year 1900. Earth changes are apparently at work as the earth’s major tectonic plates move, shift, slip and grind against each other while floating on top of ‘the mantle’ of semi-fluid magma and hot rock that comprises most of the earth’s volume. The USGS website acknowledges that earthquakes above magnitude 7 have remained fairly constant. They also site that the number of seismogram stations has increased significantly, along with faster communications. This is true and logical, however in their words, “This increase in the number of stations and the more timely receipt of data has allowed us and other seismological centers to locate earthquakes more rapidly and to locate many small earthquakes which were undetected in earlier years.”, they confirm that this has allowed detection of smaller earthquakes, and have allowed the overall detection of earthquakes to be faster. Nowhere have they addressed the range of earthquakes between magnitude 5.0 and 6.9 as to why they have apparently increased in frequency of late. I find that to be interesting. How is your survival preparedness? Enjoy the weekend and give thanks to Christ for showing you the last day signs. Remember, He gave us all these signs so we would be ready to meet Him when He calls His Church out of this world. Since all the last day signs are taking place He is showing everyone who will see and hear, we are very close to the rapture of the Church. Prophecy Sign: The Lord gave us many specific signs to watch for. When we saw these things we would know for sure our time on Earth is almost over and Christ would remove His Church from the wrath to come. Here is quiz for you. Let’s find out if you have learned anything at my site. Read the quotes below and then pick the correct answer. 1. The protesters are up-set with Emanuel for not having two wives. 2. The protesters want Emanuel. to send them more artichokes. 3. The protesters stand with God on Zechariah 12:3. 1. America is gaining in strength because God is number one in America. 3. 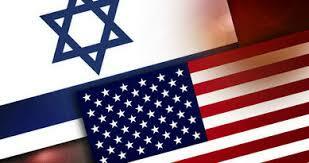 America is under God’s Genesis 12:2 curse for trying to divide Israel. 1. We should watch North Korea because they make great pizza. 2. We should watch South Korea because they want to be on the Dancing with the Stars program. 3. We are seeing Jesus words in Matthew 24:7 coming to pass, which warn on wars and rumors of war. 1. Growing marijuana is helping America’s kids get taller, and smarter. 2. Oakland wants to serve marijuana with Cool Aid and tax both the Cool Aid and drug. 3. The trend to make drugs legal is help fulfilling Revelation 9:21 which shows the last generation will be known as the drug generation. 1. Greek frogs are supporting the labor Unions who are on strike in Greece over Greece’s job cuts. 2. Greece’s frogs are looking for Moses. 1.BP, The British Oil Company poured mud down the wrong holes and the Earth is upset. 2. Powerful earthquakes and volcanoes are a sign from Satan who is trying to get you to pay attention to Jesus. 3. In Luke 21:11 Jesus warns us to look for earthquakes and fearful sights in the last days. 1. Syria and the Lebanese government are using the empty missiles to plant flowers to compete with Israel’s blossoming desert. 2. Syria and the Lebanese government want to create their own Stonehenge. 3. Syria and the Lebanese government are getting ready for the Psalm 83 war. 1. 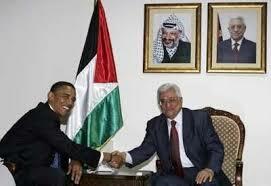 Obama and Abbas have Israel’s best interest at heart, and they only want to borrow Jerusalem for a while..
2. Obama and Abbas are working to drive the Israeli’s to the Red Sea. 3. The Obama and Abbas talks is a warning of the call for peace and safety as laid out in I Thess. 5:3. 4. Both 2 and 4 are correct. Prophecy Sign: The list below is a list of what? 1. 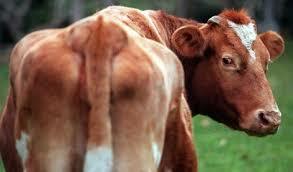 Methane gas from cows in different locations. 3. The signs of the many earthquakes Jesus asked us to watch for found in Matthew 24:7. What may happen in America. Prophecy Sign: Luke 21:11 Jesus tells us to look for "great earthquakes. The was a 7.6 quakes today. "The quake prompted the Pacific Tsunami Warning Center to issue a regional tsunami warning for Vanuatu, the Solomon Islands and New Caledonia." The "7.6 magnitude earthquake has struck off the Pacific island of Vanuatu, according to the U.S. Geological Survey. " There were no immediate reports of damage or injuries. Why Are So Many Horrible Things Happening To America All Of A Sudden? Once upon a time the United States was a land of abundance and prosperity that was truly blessed from sea to shining sea. Tens of millions of Americans enjoyed living the American Dream in a land filled with happy, healthy and prosperous people. But these days it seems as though there are new stories of tragedy and despair almost daily. Whether it is the massive oil spill in the Gulf of Mexico, or the horrific flooding in Tennessee, or the tornadoes ripping through the Midwest, or the gut-wrenching economic despair in cities like Detroit, it just seems like a whole lot of horrible things are happening to America all at once. So why is all of this hitting the U.S. right now? Why does it seem like there is just about nowhere in the United States right now that is untouched by a major crisis? Oil continues to gush into into Gulf of Mexico at a staggering pace. At this point, at least 4.2 million gallons of oil have poured into the Gulf of Mexico, and the Gulf Coast region is bracing for an environmental nightmare of unprecedented magnitude. The truth is that even if this oil spill is completely stopped tomorrow, the oil that has already been spilled is going to cripple the seafood and tourism industries in the Gulf for years. The great natural beauty of the region is going to be seriously marred, and hundreds of species are going to have their habitats absolutely devastated. "It is so big and expanding so fast that it's pretty much beyond human response that can be effective. ... You're looking at a long-term poisoning of the area. Ultimately, this will have a multidecade impact." "This is going to destroy the Mississippi and the Gulf Coast as we know it." Massive storms recently dumped nearly 20 inches of rain on many areas of the southeast United States, killing at least 27 people and putting many areas of Nashville, Tennessee deep under water. In fact, it is being projected that the damage to the city of Nashville alone is close to a billion dollars. The Tornadoes That Have Been Ripping Up The Midwest And The Southeast At least five people were killed on Monday as a number of very dangerous tornadoes ripped across the state of Oklahoma. But that is nothing compared to the unprecedented outbreak of tornadoes in the southeast recently. Officials there said that 61 tornadoes erupted when a massive storm marched across an area stretching all the way from Mississippi to South Carolina. Winds inside some of those tornadoes were clocked as high as 160 mph, and one of the tornadoes had a base one and a half miles wide. Can you imagine a tornado that is a mile and a half wide heading your way? Those tornadoes killed at least 12 people, and it is estimated that the damage that they caused could reach into the billions of dollars. Honeybees are dying off all over the United States, and without them we are going to be in a world of trouble. For the fourth year in a row, over a third of all bee colonies in the United States failed to survive the winter. If you are not highly alarmed when you read that last sentence you need to be. According to the annual survey by the Apiary Inspectors of America and the U.S. government's Agricultural Research Service, the number of managed honeybee colonies in the U.S. fell by 33.8% last winter. So why are honeybees so important? Well, because a third of all that we eat depends upon honeybee pollination. Most flowering plants require insects for pollination. The most effective insect for pollination is the honeybee. So if the number of honeybees continues to dramatically decline, we are going to be faced with a wrenching food crisis. Are you prepared for that? But it just isn't in the southwest that crime is on the rise. Violent crime is rising dramatically across the United States. Lawmakers in Illinois have become so alarmed by the violence in Chicago that they are considering asking the National Guard to be sent in. The truth is that there are over 2.2 million people in prison in the United States, and yet violent crime continues to escalate. In New York City, the number of homicides in the first quarter of 2010 had increased by approximately 22 percent compared with 2009. The reality is that America is a nation that is ravaged by crime. There are approximately 12 million crimes committed in the United States every single year. That is by far the worst in the world. The Death Of Detroit And Other Midwest Cities. Crime is especially bad in dying cities such as Detroit, Michigan. It is incredibly sad, but after years of economic decline, Detroit literally looks like a war zone and violent crime is thriving. So far this year in Detroit, car thefts are up 83%, robberies are up 50%, burglaries are up 20% and property destruction is up 42%. ut Detroit is not alone. This pattern is repeating itself in dying cities across the Midwest where unemployment is rampant. This is what we get when we allow all of our manufacturing jobs to be shipped off to China and India. But it just isn't the middle of the country that is suffering economically. In fact, many claim that it is California that is actually the epicenter of America's economic collapse. There are now 8 counties in the state of California that have unemployment rates of over 20 percent. As the real estate industry has crashed throughout California, businesses have been closing in droves. In the area around Sacramento, California there is one closed business for every six that are still open. This horrific economic decline has played havoc with state coffers. The state government of California is flat broke, and they will have to continue to beg for more loans for years to come. Californians already have to pay some of the highest taxes in the nation, and yet it is not nearly enough to cover what the state government of California is spending. As the economic decline spreads across the United States, an increasing number of people are finding themselves forced to rely on the government in order to survive. The U.S. Department of Agriculture has announced that 39.68 million people, or 1 in 8 Americans, were enrolled in the food stamp program during February, an increase of 260,000 from January. Almost 40 million people on food stamps? This was unimaginable years ago, but today America has become a socialized welfare state. Once upon a time, the old timers would warn us that someday we would all be standing in "bread lines". But today, food stamps are the new bread lines. Tens of millions of Americans are totally dependent on the U.S. government for their daily bread. That is not a health economy (or a healthy society for that matter) by any definition. Well, certainly there are a lot of reasons, but it certainly does not help that we have allowed the government to push God totally out of public life. This is how bizarre it has gotten - seniors have actually been ordered to stop praying before meals at Port Wentworth's Ed Young Senior Citizens Center near Savannah, Georgia because officials say it would violate the separation between church and state. As a society we have told God that we want nothing to do with Him. We have pushed and pushed and pushed Him into the shadows, and yet we are so surprised to learn that record numbers of our young people are rejecting the Christian faith. When are we going to learn? When are we going to start turning back to the principles that once made America great? We have tried to make the government the "all-powerful" one that takes care of us and provides everything that we need. Sadly, America is beginning to see the results of such foolishness. One of the major reasons why the U.S. has been having real bad problems is because the leaders of the U.S. have gone against God and are trying everything in their power to divide up Israel and to give Jerusalem back to the PLO! Today, Friday at 6:00 PM EST my newest radio/video show will be aired. This is important news that proves God’s Words are coming to pass. Just clink to the link below and it will take you to the show. As long as I am writing about the mark of the beast, our generation has the technology to place a chip in your hand to monitor your every move. This technology no doubt will be used by the Antichrist is one form or the other. Here is an interesting look at these implants. “RFID chip implanted into man gets computer virus” Watch video. How long before this war breaks out? When you read the entire report they think it won’t happen this summer because Hizbollah is working out internal matters however, considering the last days events will happen like a women with birth pains I would be on guard for this war to break out at any time. There is another reason why I think the war may happen sooner than most think. Paul, in I Thessalonians 5:3 warns of a sudden destruction that will happen. I quote, “While people are saying, "Peace and safety," destruction will come on them suddenly, as labor pains on a pregnant woman, and they will not escape. Jesus warned us about the labor pains and we see the same thing being said about a sudden destruction taking place while the peace call is being heard. Everyone should know by now that we are hearing the call for peace and safety, so the next thing to happen will be the sudden destruction. Speaking about the call for Peace and safety in my December 8, 2009 post I warned you that plans have been made to move troops into Israel to force a peace plan. I am posting what I stated in that Dec. 9, 2009 post because it is important in light of what I read today. “I quote, “European Union foreign ministers have agreed that Jerusalem should be the capital of both Israel and a future Palestinian state following two days of talks in Brussels. The ministers dropped an earlier proposal by the Swedish EU presidency to explicitly support the idea of East Jerusalem as the eventual capital of Palestine. The meeting adopted a text stating that Jerusalem should provide "the future capital of the two states," as part of a negotiated settlement. The Israeli government had denounced the Swedish proposal, calling it a "dangerous" threat to peace efforts and saying it would undermine the EU's role as a Middle East peace mediator.” Another quote, “The EU has attempted to breathe new life into Middle East peace talks by calling for Israelis and Palestinians to share the sacred city of Jerusalem. "The European Union calls for the urgent resumption of negotiations," EU foreign ministers said in a joint statement on Tuesday (8 December).” Some months ago I gave a link to news from Israel what was entitled, “Gog Gathering Steam?” In this report they talk about how the next war may begin. I asked you to watch the video which Dr. Brzezinski speaks about Obama and the UN using troops to force Israel into a two state nation and to split up Jerusalem. I told you back then to watch the news because I believed this was the plan to force peace in the Middle East. When you click to the click of the “God Gathering Steam?” report you will notice that they took off the video, which Brzezinski tells what they plan to do. However, the video below that one also shows their plans for Israel, but they did not remove this one. Below I am supplying a part of the speech that Dr Brzezinski, a top Obama advisor, gave at the Chatham House. In it below, at about 5min and 20 seconds in, he describes the nations of the world, all agreeing, to participate in the push to wrest Jerusalem from Israel. He states emphatically that all the nations of the world (6min 26 sec.) will back up this effort. At 8:22 in this video clip below, Brzezinski talks about the demand to divide up Jerusalem. He ends his talk with a joke, saying that if the West's plan of how to make peace is wrong, we'll be no worse off than we are now. It's not funny, because maybe HE won't be worse off, but Israel will have had it's limbs amputated, been downsized, broken up and carved out, and Israel could not survive having a PLO terror state inside of our borders, having the Arabs in rocket target fire distance of our major international airport, and being a country that at one point is only 9 miles wide and can be cut in half at the Mediterranean Sea. Add to this, the by-now famous video of Barak Hussein Obama's advisor and staff member Samantha Power, who alludes to an invasion of Israel by the USA and Western forces to enforce their idea of peace. And to put more gasoline on this fire, see this article which describes a new foreign policy for the USA regarding abandoning Israel. In another story, Israel's chief of Staff left the USA trip he was on early, because he was 'dissed' there with no one of his level or who had any policy influence on Obama's staff could find the time to meet with him. He came to discuss Israeli intelligence on Iran's nuclear reactor and to discuss ways to stop Iran from possibly triggering a third world war. Instead, the U.S. president had other things to do like go and be a guest on Jay Leno's Tonight Show. I am not sure where his other upper staff was, maybe they were busy being contestants on Deal, or No Deal. But no one had time to meet with our chief of Staff Gabi Ashkenazi to set a plan of action on how to deal with Iran and it's nuclear threat, not just against Israel, but against America as well. Let's not forget that Iran is in bed with Hugo Chavez and has opened a base in Venezuela and Nicaragua, too close to comfort for Americans. Instead, the American administration is unfortunately gravitating towards wooing the Arabs, and are wanting to see a Palestinian State established. The nations are grumbling. The nations are getting antsy and impatient, the West, and the Arabs. History is speeding up. A possible planned invasion of troops by different nations of the world can converge on Israel, either from the East, or the West. Are we seeing the signs that this war shall soon materialize? Now look at what the current news on this same subject. I quote, “NEW YORK – A U.S. plan envisions stationing international troops along Israel's border with a future Palestinian state, WND has learned. Palestinian Authority officials privy to the plan say the Obama administration proposed deploying NATO soldiers along the Palestinian side of a future border with Israel as well as along the borders of Jordan and any future Palestinian state. Israeli government sources confirmed such a plan has been proposed. The sources said the concept is not exclusive to the Obama administration. Both Presidents Clinton and Bush broached the idea of stationing international troops along the borders of a future Palestinian state.” This report goes on to say the UN troops haven’t shown to much success in the past in stopping conflicts, but I think Obama still may try and force U.S. and UN troops into Israel to force peace in the region. One thing is clear to us, God and Obama do not see eye to eye!!!!! What Obama is trying to do to Israel is against what God’s teachings, and the United States has been placed under the Genesis 12:2 curse because of the Obama’s plans to divide up Israel into two States, and give East Jerusalem back to the PLO. One may ask, do you think the financial crisis in America and the oil pouring out of the gulf has anything to do with the curse? While Obama is making moves to divide Israel it appears God is wiping out the fishing industry in the gulf at a time when American need to find more jobs. Most people who read reports like this one never make the connection between what Jesus has warned us, and how it connects to Bible prophecy, and that includes Christians. Since most Pastors do not spend much time teaching their flocks about prophecy most Christians are not ready for what is taking place. Not long ago I received a e-mail from something who told me her pastor said since the Church is saved they don’t have to worry about watching for the signs. Any pastor who tells you this better reread Christ’s warnings. Jesus repeated Himself over and over again in telling us to watch and be ready! If you have been reading the news you know how the debt issue is bringing on tensions all around the world. Greece’s debt problems are still headlined in the news and what happened to Greece is going to happen to many other nations around the world and that includes the United States. Today’s U.S. debt is reported to be $13,000,000,000,000, and counting! 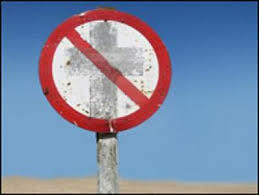 If you don’t believe my warnings that Jesus is coming back soon please read this headline: “Warning: Crash Dead Ahead. Sell. Get Liquid. Now.” Read the entire report and keep these things in mind. First the crash will come, then the Antichrist. For the believers, we look for Christ to remove us from the time of wrath. Prohecy Sign: In Revelation 18:12 Christ gives details on items that people will be weeping over when these items are taken away. Two of these items are gold and silver. Since opening my site I have warned you the price of both these metals were going to climb like never before. On May 3, 2010 I warned you all again to watch for the prices of these metals to continue to climb. The reason why these prices are going up is because we are getting closer to the beginning of the seven year tribulation. The faster paper currencies plummet the faster these metals will climb. There was another record broken again concerning gold. “May 24 (Bloomberg) -- Speculators are buying gold faster than the world’s biggest producers can mine it as analysts forecast a 27 percent rally that may extend the longest run of annual gains since at least 1920. Exchange-traded products backed by bullion added 41.7 metric tons in the week to May 14, the most in 14 months, data from UBS AG show. China, Australia and the 15 other largest mining nations averaged weekly output of 41.6 tons last year, researcher GFMS Ltd. estimates. 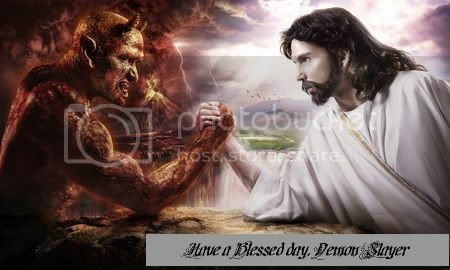 Even though prices have fallen 4.6 percent to $1,191.65 from a record $1,249.40 an ounce May 14, the median in a Bloomberg survey of 23 traders, analysts and investors shows it will reach $1,500 by the end of the year.” If you refuse Jesus Christ and His warnings about His coming for His Church you are going to be left behind to see not only the Antichrist but gold prices reaching levels unheard of. There are many experts who are predictions the price of gold will reach $3.000 per ounce. I think they will climb even higher. The sharp sell off on Wall Street and with equities internationally saw gold decouple and surge in all currencies yesterday. Oil, commodities and bonds also fell sharply in incredibly volatile trading. Gold was up by more than 2% in dollar terms and by more than 3.5% in euros and pounds as the euro and pound fell sharply on contagion fears, hung parliament and economic concerns respectively. Gold reached new record nominal highs in sterling, euros and Swiss francs and 27 year highs in Japanese yen, also reaching a five-month high in dollars. Given the scale of the international debt crisis, the December record (nominal) high of $1,226 per ounce (interday) could be reached in the coming days and respected analysts are now forecasting gold to rise to $3,000 per ounce (see News). This is the bottom line. We are witnessing the exact same signs as Jesus told us to look for. He is telling us all via all these signs that the time to get ready to meet Him is right now! Prophecy Sign: Once again we are seeing signs that the global economy is in a major crisis. While the prices of gold and silver are climbing we are also witnessing the signs that a major shift in the global economy is about to take place which will end up falling in the lap of the Antichrist. As soon as the world is tossed into chaos over the collapsed economy that is when the people of the world will be yelling for someone to correct the markets and bring back some time of world order. Out of this new order the Jesus shows us that the Antichrist will control the markets by forcing everyone to take his mark which Jesus warns will be put in the right hand or forehead. See Rev. 13:16-17. “SINGAPORE (AP) - World stock markets tumbled Tuesday, extending Wall Street's sell-off as the sliding euro fueled a new wave of pessimism about the global economy's health. Renewed worries about Europe's debt problems rattled already anxious investors, who grew more uncertain about the outlook for the U.S. and global economies.” Listen to what I am about to tell you. One morning you are going to wake up to the worse global crisis this planet has ever seen. The markets are going to drop like water over Niagara Falls, and then the panic will begin. The Antichrist is coming to destroy as many of you as he can. 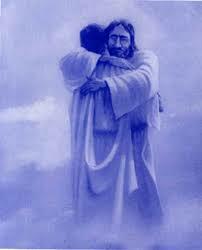 You can escape to safety but it will only be in the arms of Jesus Christ. If you deny Jesus is your Lord and Savior you will get ready to be tossed headlong into the seven year tribulation. Prophecy Sign: Watching the news I can see Jesus words concerning civil unrest and wars are surely coming to pass. This week so far the hot spots are Jamaica, Korea, Mexico, and of course Afghanistan. I am in the process of putting a new prophecy seminar together, and adding new information to my prophecy book. I will be taking a week off starting today May 21, 2010 so I can complete my work or at least make an attempt to do so. I am asking you all to check out my previous warnings at my site and watch the news this week. It is my prayer that my work over the past three years will help you to connect the dots between Bible prophecy and current events for yourselves. If something major in prophecy breaks during the week, I will make sure you hear about it. Thank you all for coming to my site and God Bless. 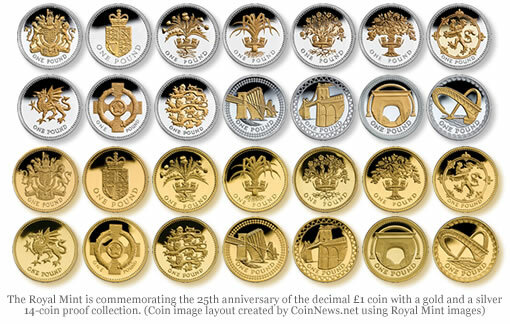 There is more talk today concerning nations dropping out of the euro. "The euro has many flaws, but its weakest link is Greece, whose fundamental problem is that for years it spent too much, earned too little and plugged the gap by borrowing in order to enjoy a rich man's lifestyle. It flouted EU rules on the limits to budget deficits; its national accounts were a moussaka of minced statistics, topped with a cheesy sauce of jiggery-pokery." "
What was once deemed unthinkable is now, I believe, inevitable: withdrawal from the eurozone of one or more of its member countries. At the bottom end, Greece and Portugal are favourites to be forced out through weakness. At the top end, proposals are already being floated in the Frankfurt press for a new "hard currency" zone, led by Germany, Austria and the Benelux countries. Either way, rich and poor are heading in opposite directions." Go back and read my posts. I keep telling you hundreds of thousands are still going to get pink slips as America keeps declining just like Greece is doing. Here is the proof what I have been telling you is coming to pass. " "WASHINGTON – The number of people filing new claims for unemployment benefits unexpectedly rose last week by the largest amount in three months. The surge is evidence of how volatile the job market remains, even as the economy grows. Applications for unemployment benefits rose to 471,000 last week, up by 25,000 from the previous week, the Labor Department said Thursday. It was the first increase in five weeks and the biggest jump since a gain of 40,000 in February" Now is the time to give your life over to Jesus Christ. All these signs point to the rise of the Antichrist. While the unsaved is blind sided and doesn't see the signs for the rise of the Antichrist, we the Church should be looking for Christ. All these signs should get you excited, because they are signs the rapture is not far off. This Friday at 6:00 PM EST my newest radio/video show will be aired. This is important news that proves God’s Words are coming to pass. Just clink to the link below and it will take you to the show. I have been warning you that the gold and silver prices would skyrocket. I asked you to watch the news because you will see what I am warning come to pass. I am not a prophet, but I know what Jesus has warned us! 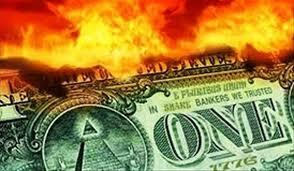 I have also tried my best to warn you of the collapse of the U.S. dollar. China sees what is coming and look at what they are doing to prepare. When the global economic crisis gets worse those who hold U.S. dollars will wish they were holding the only things that really hold their value. I am in the process of putting a new prophecy seminar together, and adding new information to my prophecy book. I will be taking a week off from writing to complete this. I am asking you all to check out my previous warnings at my site and watch the news this week. It is my prayer that my work over the past three years will help you to connect the dots between Bible prophecy and current events for yourselves. If something major in prophecy breaks during the week, I will make sure you hear about it. Thank you all for coming to my site and God Bless. Prophecy Sign: In Chapter 2 of the Book of Daniel God showed Daniel who was going to rule the world from the Babylon Empire all the way to the last world empire which Jesus later shows us in the Revelation would be the eithth and final empire This last empire would be the one the Antichrist will reign over. As time passes events surrounding the nation Turkey become more important. 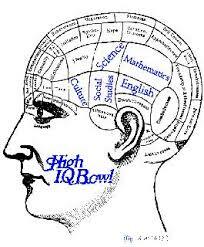 I explain this in detail in my Oct. 27, 2009 post which I have the link to below. If you haven’t read that post I suggest you read it. I will tell you this, current events are sure leading us toward Turkey’s rule as the possible empire Jesus pointed to. Here it is in a nutshell. Daniel was told at the time the Messiah comes back there would be one man ruling the world. This of course is the Antichrist. Daniel shows us that this last empire was going to be a revived Roman Empire. At the present time the old Roman Empire has already been revived in both of it old legs. The Western leg we have the European Union which is showing signs it may breaking up, and the Eastern leg which is a group of Islamic nations that also used to be in the first Roman Empire. We have been keeping our eyes on both of these legs because we can not say with 100% certainty which one of these legs is the one Jesus pointed to. I will say this, because of the latest news we are leaning toward the Eastern leg. While Turkey is moving to patch things up between Israel and Iran she has also taken on the Middle East peace talks. “Reuters) - Syria is ready to reopen peace talks with Israel, with Turkey serving as a mediator, but Israel has not asked Ankara to resume that role, Turkish President Abdullah Gul said on Saturday.” All this news is important, because while the EU is showing signs breaking up Turkey and the other nine ECO nations are gaining power via the failing economic crisis. Let me connect the dots. 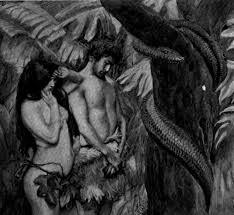 The man of sin (Antichrist) is going to be the one who will confirm a seven year covenant with Israel and many nations. This man comes from the Roman Empire. The old Ottoman Empire has risen again via Turkey and they are getting active in the peace process again. At the same time banks around the world are failing as nations struggle to stay afloat from all there debt, but not the Islamic banks! These banks have been growing at a rate of 15% each year. I think it is very possible that when the global economic crisis hits the Eastern leg of the old Roman Empire will suddenly rise up to assume the last world empire position. I believe the current economic crisis is paving the way for that to to place. If you count the number of mountains you will count seven. If you don’t understand the warning from Christ pointing to the eighth empire you won’t understand the meaning of this photo, and that is why it will be really important for you to read my Oct. 27, 2010 post. Let’s say the EU is not the leg God pointed to. Let’s say the EU slides deeper into in the economic crisis and some of the nations like Greece and Spain fail causing the global economic crisis to get worse. If this happens and the EU loses power it would be a good indication that the Western leg is not the leg that will end up being the one we were warned about. In that case I would say we would see the Eastern leg get stronger and stronger. I will be Frank with you. 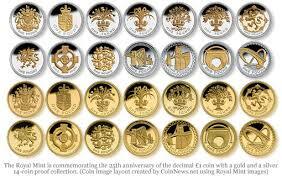 I am also watching to see if the 16 euro nations drop down to ten nations as the economic crisis in the EU unfolds. In my previous post a few days ago I showed you that Jesus said ten kings would hand over all their authority to the Antichrist. A the present time there are six euro nations on the edge of failing away from the euro. If this does happen and ten stay together this still may be fulfilling the warning from Daniel telling us they will not adhere. For this reason I am not ruling out the Western leg of the old Roman Empire yet. I do know that as time passes we will see a much clearer picture. I keep giving you signs America is on the road to collapseing. Yesterday I brought up up to speed on the number of U.S. banks that have failed so far this year. Last year I warned you mortgage crisis in the U.S. was going to get much worse and add to the economic crisis. My posts are still up for all to review! Today my warning has seen the light and I quote, “WASHINGTON (AP) -- The mortgage crisis is dragging on the economic recovery as more homeowners fall behind on their payments. Analysts expect improvement soon, but the number of homeowners in default or at risk of foreclosure will have a lingering effect on the broader economy. More than 10 percent of homeowners with a mortgage had missed at least one payment in the January-March period, the Mortgage Bankers Association said Wednesday. That's a record high and up from 9.1 percent a year ago.” fifteen million people are still out of work and more layoffs are coming. U.S. states budgets are coming up and already we are getting word that thousands will be getting pink slips as the states try to trim their debts. I don’t expect you all you believe me when I warn you the worse global economic crisis in the history of the U.S. is heading toward us like category five tornado. Prophecy Sign: Speaking about Turkey and Iran, God told Ezekiel that these two nations along with other Islamic nations that would attack Israel with Russia in an attempt to wipe them out forever. I am warning you all again the signs from the current news is pointing to this war coming soon. I quote, “Head of Iranian President Mahmoud Ahmadinejad's office said that if Israel attacks Iran, it will be destroyed within a week. He made these statements at a political conference of the conservative extremist camp in the north of the country. According to former vice president Esfandiar Rahim Mashaei, "If the Zionist regime attacks Iran, the Zionists will not remain alive more than a week."